At high frequencies the luminosity overlap between the two classes can be as much as two orders of magnitude. Various properties of sources in the two classes are different, which is indicative of a direct link between luminosity and the way in which energy is transported from the central region and converted to radio emission in the outer parts. We will now provide a somewhat more detailed description of the Fanaroff-Riley classes. Fanaroff-Riley Class I (FR-I) Sources in this class have their low brightness regions further from the central galaxy or quasar than their high brightness regions (see Figure 9.3). The sources become fainter as one approaches the outer extremities of the lobes and the spectra here are the steepest, indicating that the radiating particles have aged the most. Jets are detected in 80 per cent of FR-I galaxies. A jet can begin as one-sided close to the core, but beyond a few kiloparsec it becomes two-sided and continuous, with an opening angle 8 deg that varies along its length. Along the jet the component of the magnetic field in the plane of the sky is at first parallel to the jet axis, but soon becomes aligned predominantly perpendicular to the axis (see Figure 9.10). FR-I sources are associated with bright, large galaxies (D or cD) that have a flatter light distribution than an average elliptical galaxy and are often located in rich clusters with extreme X-ray emitting gas (Owen and Laing 1989, Prestage and Peacock 1988). As the galaxy moves through the cluster the gas can sweep back and distort the radio structure through ram pressure, which explains why narrow-angle-tail or wide-angle-tail sources, say, appear to be derived from the FR-I class of objects. Figure 9.3. VLA map of the FR-I galaxy 3C 449 at 1465 MHz, with angular resolution 4.8 x 3.4 arcsec2. The peak flux is 22.2 mJy per beam, with contours drawn at 5 per cent intervals, beginning with the -5 per cent contour. Reproduced from Perley, Willis and Scott (1979). 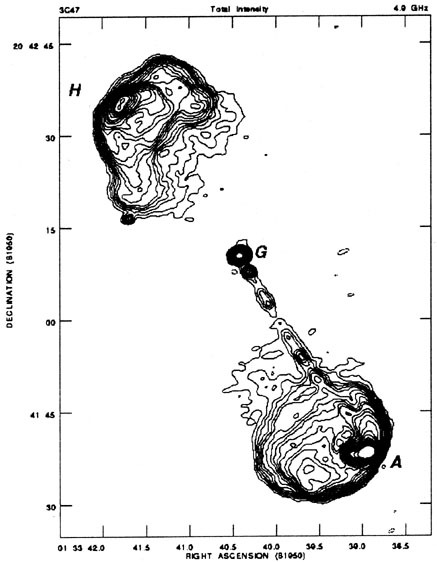 A typical FR-I galaxy is shown in Figure 9.3 (Perley, Willis and Scott 1979). This is the radio source 3C 449, which is optically identified with a galaxy of type cDE4 at a redshift of 0.0181, so that 1 arcsec corresponds to 255 h100-1 pc. There are twin jets that are straight for ~ 30 arcsec from the core, after which they deviate towards the west and terminate into diffuse lobes. These jets and outer lobes are mirror symmetric about an axis through the core. The jets are generally smooth in appearance, but higher resolution observations show knots on a smooth ridge of emission, the southern jet being more knotty than the northern one. Within ~ 10 arcsec of the nucleus, the surface brightness of the jets is much reduced. The jets widen at a non-uniform rate close to the core, with the greatest expansion occurring where the jets are faintest. Beyond ~ 10 arcsec from the nucleus the opening angle is constant at ~ 7 deg. The emission from the jets is highly polarized, the average polarization over the jets being ~ 30 per cent, and the projected magnetic field is perpendicular to the jet axis. Fanaroff-Riley Class II (FR-II) This class comprises luminous radio sources with hotspots in their lobes at distances from the centre which are such that RFR > 0.5. These sources are called edge-darkened, which was particularly apt terminology when the angular resolution and dynamic range used in observing the classical sources was not always good enough to reveal the hotspots as distinct structures. In keeping with the overall high luminosity of this type of source, the cores and jets in them are also brighter than those in FR-I galaxies in absolute terms; but relative to the lobes these features are much fainter in FR-II galaxies. Jets are detected in < 10 per cent of luminous radio galaxies, but in nearly all quasars. The jets have small opening angles (< 4 deg) and are knotty; the jet magnetic field is predominantly parallel to the jet axis except in the knots, where the perpendicular component is dominant. An example of an FR-II source is shown in Figure 9.4. which is a VLA map of the radio quasar 3C 47 made by Bridle et al. (1994). The most striking feature of the jets in the FR-II class is that they are often one-sided, as is clearly seen in Figure 9.4. Jet one-sidedness occurs at large (kpc) scales as well as in the milliarcsecond jets which are found in compact cores through VLBI observations and which will be discussed further in Section 9.5. The feature A in the jetted lobe is a hotspot, while feature H on the unjetted side looks like one, but does not qualify for being a hotspot according to the criteria of Bridle et al. (1994) listed in Section 9.2. FR-II sources are generally associated with galaxies that appear normal, except that they have nuclear and extended emission line regions. The galaxies are giant ellipticals, but not first-ranked cluster galaxies. 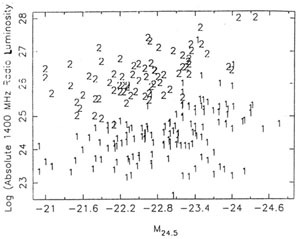 Their average absolute magnitude < MR > = -19.9 (H0 = 100 km sec-1 Mpc-1) is close to the characteristic value M* of the Schechter galaxy luminosity function (see e.g. 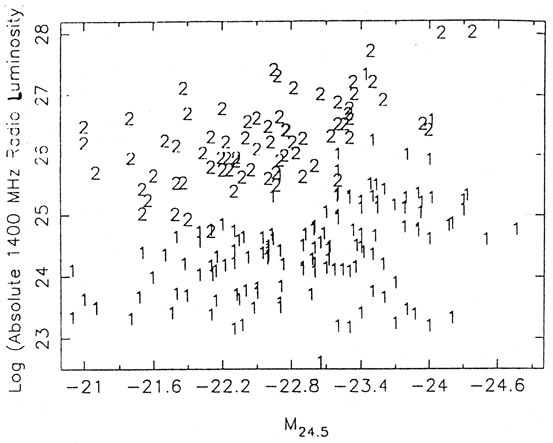 MB81, p. 352) at which the density of galaxies shows an exponential turnover. The environment of FR-II sources does not show enhanced galaxy clustering over the environment of randomly chosen elliptical galaxies (Owen and Laing 1989, Prestage and Peacock 1988). Owing to the large differences in the nature of the host galaxies and the environments of the FR-I and FR-II sources, it is possible that they are intrinsically different types of source not related to each other through an evolutionary sequence (but see the remark towards the end of this section). Figure 9.4. A VLA map of the FR-II quasar 3C 47 (Bridle et al. 1994) made at 4.9 GHz with 1.45 x 1.13 arcsec2 resolution. G is the core, A the jetted hotspot. H does not meet the hotspot criteria of Bridle et al. The figure was kindly provided by Alan Bridle. Host galaxies The host galaxies of radio sources have the general appearance of ellipticals but high dynamic range charge coupled device (CCD) images reveal morphologies that are rather complex and disturbed. A detailed study of bright radio galaxies from the Molonglo Reference Catalogue (MRC) by A. Mahabal, A. Kembhavi and P. McCarthy (Mahabal 1998) has shown that in nearly every case there is evidence of a significant departure from the simple structure expected in an elliptical. One can see the presence of disk-like structures, spiral arms and on occasion multiple nuclei. These features can be seen in direct images after careful image processing, but are more readily evident in two-colour images. The intensity profiles of normal elliptical galaxies in most cases are well fitted by de Vaucouleurs' law given in Equation 9.7 below. But the profiles of radio galaxies in several cases show significant departures from such a law, and the presence of a significant disk component with exponential intensity distribution can be inferred. Radio galaxy images also show the presence of dust and the signs of interaction with neighbouring galaxies. We show in Figure 9.5 a B filter image of the MRC radio galaxy 1222-252. Structure on different scales is evident in the direct image, and the disk-to-bulge luminosity ratio inferred for this galaxy is 2.5. Figure 9.5. CCD image in the B filter of the MRC radio galaxy 1222-252 taken with the 1 m telescope of the Carnegie Observatory at Las Campanas. The image was kindly provided by A. Mahabal. Bivariate classification The Fanaroff-Riley classification of a galaxy depends on its radio luminosity: most galaxies that are brighter than 2 x 1025 h100-2 W Hz-1 str-1 at 178 MHz are of the FR-II type, while less luminous galaxies belong mainly to the FR-I class. The division between the two classes becomes sharper if the distribution as a function of radio luminosity as well as of absolute optical magnitude is taken into account. This can be seen in Figure 9.6, which shows the distribution of FR-I and FR-II radio galaxies as a function of their optical and radio luminosity (Owen and Ledlow 1994). The two types are seen to be distributed over a wide range of optical luminosity. The brighter radio galaxies tend to be of the FR-II type, but the dividing point along the radio axis is not sharp. However, there seems to be a fairly clear diagonal division of the types, which shows that the radio luminosity at the division between the classes increases with optical luminosity. The diagonal boundary is given approximately by LR Lop2. When the two-dimensional distribution of points is projected onto the radio luminosity axis, the two types remain separated but with some mixing at the boundary. The dependence of the dividing radio luminosity on the optical luminosity is a reflection of the form of the bivariate luminosity function (see Section 7.11). Physical distinction The jets in FR-II galaxies are generally smooth, often one-sided and end in hotspots in well-separated lobes. However, jets in FR-I galaxies are two-sided, and the radio structures are often distorted and plume-like. The smooth nature of FR-II jets is thought to be indicative of highly supersonic flows, while FR-I jets are thought to be subsonic, which makes them amenable to distortions in interaction with the ambient medium. There are two possibilities for this difference in jet speeds: (1) the jets in all radio galaxies and quasars are produced in similar central engines, always emerge with supersonic speeds from the engine and are slowed down to subsonic speeds when there is sufficient interaction; (2) the engines that power FR-I and FR-II sources are different in nature, and produce subsonic and supersonic jets respectively. Models based on both these assumptions have been proposed, but the development is suggestive only, and the theoretical concepts involved as well as observational consequences remain to be explored. Figure 9.6. Distribution of FR-I and FR-II radio galaxies as a function of their 1400 MHz radio luminosity and absolute B magnitude. Reproduced from Owen and Ledlow (1994) in BDQ94. De Young suggests that jets in FR-I galaxies are decelerated a short distance outside the production region. Thus, in the short distance before significant deceleration begins, the jets interact very little with the matter, and have low luminosity, which explains the gap often found between the nucleus and the base of jets in FR-I sources (see Section 9.4). After the deceleration the jets must proceed relatively unimpeded over large distances, as otherwise the outflow would cease completely. The deceleration can be produced by transfer of momentum from the jet to a dense ambient gas if the Reynolds number is very large, which is likely to be the case for reasonable jet dimensions and speeds. The dense ambient medium can be produced by the inflow of gas into the central region, owing to stellar mass loss, flows set up by interactions, cooling flows etc. It is expected that active star formation will take place owing to the enhanced density of the central region, and also the action of the jet on it. This should make the central regions of FR-I galaxies bluer than those in FR-II galaxies. Testing such a prediction requires good signal-to-noise images in two or more colours of a number of radio galaxies, and a detailed study along these lines is yet to be made. The second possibility, that the differences between the FR-I and FR-II galaxies are due to qualitative differences in the properties of the central engine, has been considered by Baum, Zirbel and O'Dea (1995). They base their conjecture on a detailed study of the correlations between radio luminosity, emission line luminosity and host galaxy magnitude of a large sample of FR-I and FR-II galaxies; this spans 10 orders of magnitude in luminosity and contains a number of galaxies of the two types that overlap in luminosity. The principal differences found in the two types by Baum et al. are as follows. At the same host galaxy absolute magnitude or radio luminosity. FR-II galaxies produce about an order of magnitude more optical line emission than the FR-I galaxies. FR-II galaxies are orders of magnitude brighter in line emission than radio-quiet galaxies of the same optical magnitude, while FR-I and radio-quiet galaxies of the same magnitude have comparable line emission. The emission line luminosities of FR-I galaxies are correlated with their absolute magnitude. Such a correlation is not seen in the case of FR-II galaxies. FR-II galaxies produce substantially more line emission than FR-I galaxies of the same total or core radio luminosity. The emission line luminosity in both types of galaxy is correlated with total and core radio luminosities, but the regression line for each type has a different slope and intercept. There is a strong correlation between core and total radio luminosities for both galaxy types. There is continuity in the distribution of the two galaxy types in the log(Lrc / Lr,ext) logLR-plane, where Lrc and Lr,ext are the core and extended radio luminosity at 408 MHz and LR = Lrc + Lr,ext. The regression lines fitted separately to FR-I and FR-II galaxies in this plane are not significantly different. The observed distribution of the [O III] / H line ratio in FR-I galaxies is similar to the distribution for radio-quiet ellipticals and cooling flow galaxies. Baum et al. suggest that the emission lines here are of the low ionization type, which are different from the high ionization lines produced owing to ionizing radiation from the nucleus in Seyfert and other active galaxies. Since the line luminosity is also correlated with the host galaxy optical luminosity, Baum et al. conclude that the line emission in FR-I galaxies could be produced by processes in the host galaxy. In contrast to this, available evidence suggests that in FR-II galaxies the lines are produced as a result of an ionizing continuum from the nucleus. This points to a possible important difference between the central engines of FR-I and FR-II galaxies: the engines in the former produce far less ionizing radiation and funnel a higher fraction of their total energy output into the kinetic energy of the jets than FR-II galaxies. Baum et al. furthermore suggest that FR-I sources are produced when the accretion rate onto the central black hole is low, and the black hole has relatively less angular momentum; the FR-II sources arise when the accretion rate is high and the hole spins more rapidly. The different degrees of black hole spin make a difference to the nature of the jets produced, leading to subsonic jets when the spin is low and supersonic jets when it is high. As we have mentioned above, these different jet properties can lead to different levels of interaction with the ambient medium, creating different radio morphologies. Baum et al. also suggest that a high accretion rate could decline with time, causing an FR-II galaxy to evolve into an FR-I type. The correlations that have been used in arriving at this picture, the conclusions drawn from them and the theoretical conjectures all need thorough study before the scenario can be accepted as plausible. We have seen above that the environments of the two types of radio galaxy are likely to be different. This seems to argue against the two types having an evolutionary connection. 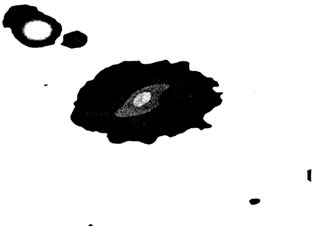 But it is possible that at least some of the FR-I galaxies began as FR-II galaxies in the dense environments of rich clusters and relatively quickly evolved to the FR-I state (Hill and Lilly 1991). 1 It may be more appropriate here to consider the core radio luminosity, but this is not known in all cases, and where known it is at least approximately proportional to the extended radio luminosity. Back.